The Fire Ball Ball Extinguisher from Elide is a manly way to put out a fire. 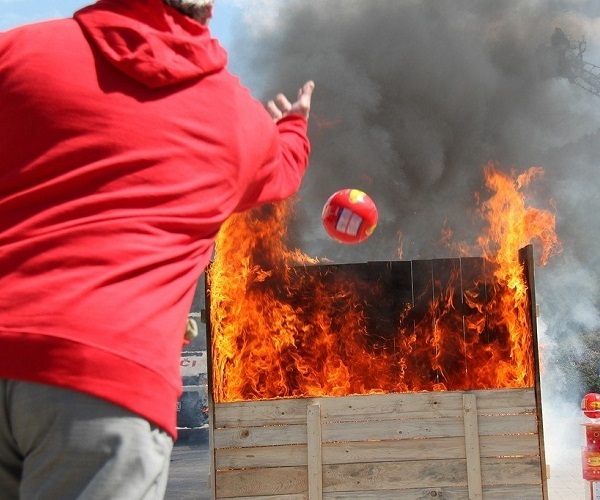 Just chuck this ball at the fire and the self-sensing product will activate in 3 to 10 seconds, exploding non-toxic powder in all directions to extinguish the fire instantaneously. Protect your love ones at home, the office, or on the road while traveling. The device is ready for house fires, car fires, and any A, B, C and E-type fires (materials like wood, flammable liquids, combustible gases, and electric fires.) No special training is required, just aim and fire!